A5 sized, 56 paged booklet with a card cover, 81 black and white plus full colour photos, pictures and diagrams. Interesting history that brought back a lot of memories. Many, if not most, of todays modellers began their careers on Airfix kits back in the fifties. Many of us have done this without knowing the origins of this, the most famous of plastic model manufacturers. Shire Library has been around as a British publisher for over forty years and has many titles under its belt. As an eight year old I began building plastic kits and along with several friends, we made aircraft models as a source of toys. Even today, in the privacy of my home, I will still fly a newly completed model around the house, shooting down imaginary bombers or strafing ground forces. We settled on Airfix because they were the cheapest, sold in more places and had the biggest range compared to the other brands. 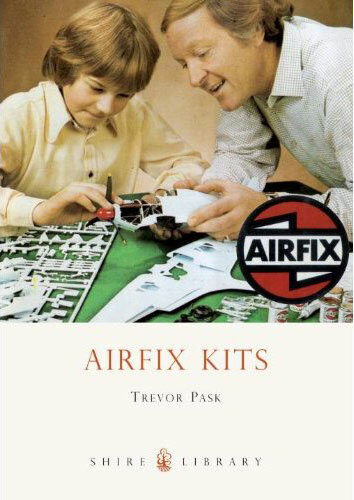 “How the Airfix kit came about” The origins of plastic kits is documented in this the first chapter from the early balsa wood creations to after WWII, the invention of Polystyrene Plastic as we know it today. “The early years – Kove, combs and kits” Founded by a Jewish Hungarian, Nicholas Kove in 1939, Airfix began by producing rubber products like swimming rings and air filled dolls heads. Plastic combs followed and finally contracted by Ferguson to produce plastic give-away models of their tractor. The chapter then gives us the rise of plastic kit makers in the USA such as Revell, Linberg and Aurora which were quickly followed by Airfix, Frog and Matchbox in the UK. “The Golden Years”. Where as the Americans adopted 1/48th as their main aircraft scale, the three British companies went for 1/72nd, the same as the pre-war Frog-penguin and Skybird models. This allowed the three and Airfix in particular, to produce a huge range of kits, far more than the bigger and more expensive US brands. Eventually, they extended their range into Armour, Ships, Cars and Figure and into the bigger scales also. “Something for Everyone - The 70s” Expanding even further with Space Craft, Motorcycles, Dinosaus and more they had become a British institusion to the point that today, plastic kits are often just call Airfix kits irrespective of who actually made them. “Difficult years and a Renaissance” Britain had fallen on hard times and along with most other home brands Airfix could not afford to produce any new moulds. The first of the “They're in trouble” warnings was releaced. Picked up by an American company, General Mills, Airfix survived but only just. They then moved on to a cemical company called Borden. They owned Humbrol, the model paint business and French model manufactured Heller. Heller caused problems and eventually, Airfix and Humbrol were picked up be Hornby who also owned Corgi and Scalectrix. Safe at last. “The Airfix Style: Box Art and Packaging” This chapter looks at the changing shape of Airfix packaging over the years, from the 2s bags to the Hornby red boxes of today plus everything in between. Over the years, the art-work was so good the books have been releaced just on Airfix box art and many of the best are represented here. Now, where's that FW 190 A-1 I just completed? Time for another flight! Thanks to Shire Library for the sample.